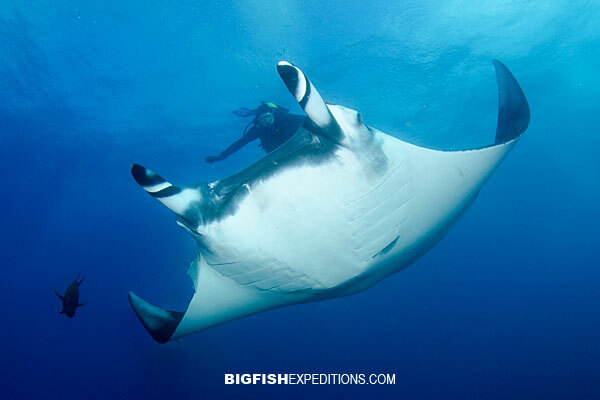 Come diving with friendly Giant Manta Rays and encounter migrating Humpback Whales. Also, expect to dive with playful bottlenose dolphins, Galapagos sharks, silkies, hammerheads, whitetip sharks and other pelagic predators at spectacular Socorro Island and Roca Partida! Join me on this 8 day expedition to beautiful Isla Socorro which lies 240 miles south of Cabo San Lucas (our point of departure for this epic adventure). 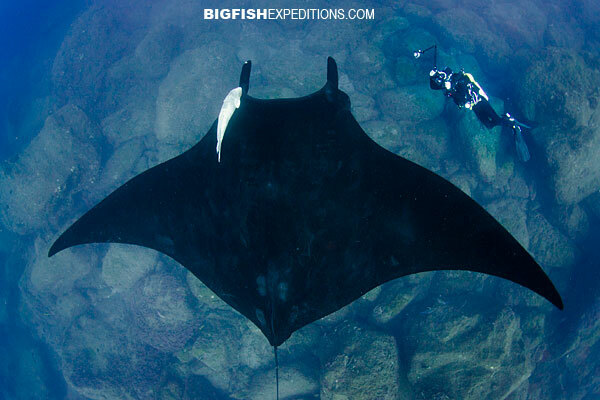 The Giant Mantas at Socorro are huge and extremely social creatures. Its hard to imagine until you dive there but these mantas actually seek out divers, returning to them dive after dive for attention. Some researchers believe that the mantas enjoy the feeling of bubbles cascading over their bodies, others think that the mantas are actually curious about the divers and enjoy their companionship. 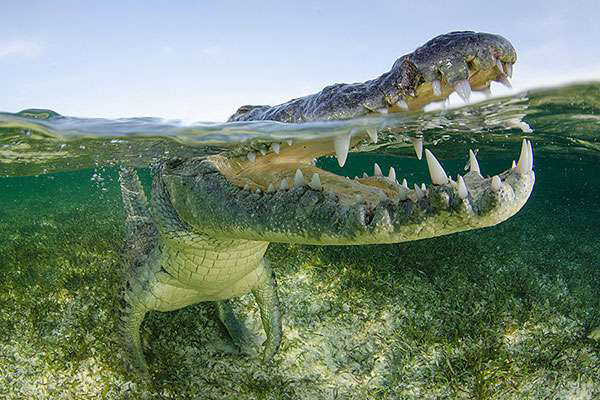 What ever the reason is, the result is extremely close encounters with enormous animals dive after dive. Socorro is one of the few places where you can see giant black mantas as well as the more conventional black and white variety. Spending an hour long dive with a six meter wide black manta that won’t leave you alone is an experience you will never forget! Moderate. Advanced open water certification preferred. At Socorro, massive mantas block out the sun! The expedition is specifically timed to arrive in the heart of the giant manta season but it is also the best time to witness the humpback whale migration when mothers are looking after their newborn calves. The calves are sometimes curious and occasionally approach lucky snorkelers and divers. Humpbacks are also known for their haunting whale songs and their acrobatic displays during which they often launch completely out of the water. Bring along a topside camera to catch these epic leaps and expect to see them slapping the surface with their enormous pectoral fins and tail flukes. The abundant marine life at Socorro attracts sharks and other pelagic predators from far and wide. 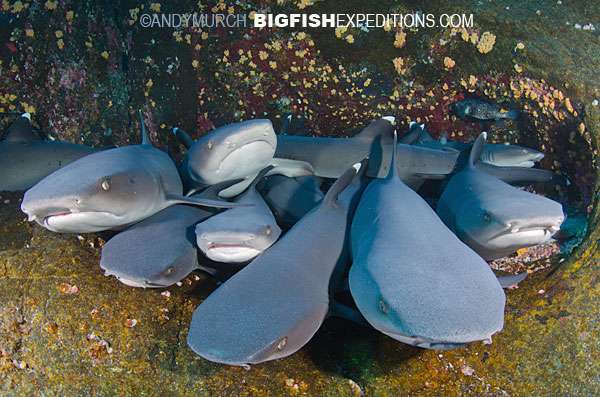 Although it’s possible to see any number of different species, the most common sharks at the archipelago are Galapagos sharks, silky sharks, silvertips, scalloped hammerheads and whitetip reef sharks. Also expect to see sea lions, huge stingrays and more moray eels and octopuses than you can point a camera at. Day 1 We depart from Puerto Los Cabos Marina in San Jose del Cabo at 11:00 a.m. It takes about 22 hrs to navigate to the first island. You can whale watch along the way, bring your favorite home movies to play in the tv room or take advantage of this lazy day to take a nitrox class. Diving Nitrox will increase your bottom time on your dives at the archipelago. Day 2 We expect to arrive in the early afternoon. The first ‘check out’ dive is for testing buoyancy, new dive equipment and/or cameras. This is usually at a relatively shallow, well protected dive site but that doesn’t mean we won’t see big animals. Even the shallow inshore sites at Socorro attract marine-megafauna so get ready with your wide angle lens! We usually conduct 2 dives during the first day depending on our arrival time at the archipelago. Days 3-6 We will dive at all of the classic sites in the Revillagigedo islands including famous spots like ‘The Boiler’ and ‘Roca Partida’. Although giant mantas will be the focus, we will also target sites that are known to have schools of hammerhead sharks, Galapagos sharks and other megafauna. If there are humpback whales present between dives, we will also try to jump in with them to take some underwater images in the clear blue water around the islands. Expect 3-4 dives per day. Day 7 On our 6th and final day of diving, we will conduct 3 dives before we say farewell to Socorro and start the journey back to San jose del Cabo. By this time you will have thousands of digital photos and hours of video to keep you busy on the overnight sail back to Cabo. Day 8 We usually arrive back at Puerto Los Cabos Marina some time in the afternoon. In case of delays on the crossing, we suggest that you overnight in a hotel in SJD on the final night. If you have any energy left after this dynamic adventure, the group usually reunites for dinner and a night on the town before departing the next morning. Don’t miss this trip! Its one of the most well-rounded adventures in the world!